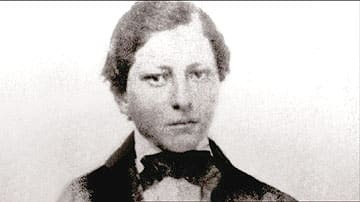 In 1857, a young boy named Louis Riel left his home on the prairies bound for Montreal. The bright 13-year-old was chosen by a local bishop, Alexandre-Antonin Taché, as a candidate for the priesthood and sent to study at the prestigious Collge de Montréal. 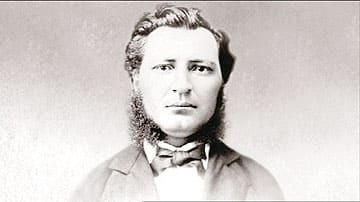 At the time, Canada was still a decade away from union and few would suspect that the young boy from the prairies would grow up to help shape the new nation, becoming the father of Manitoba. The big city of Montreal was a long way from Riel's childhood home in the Red River settlement. 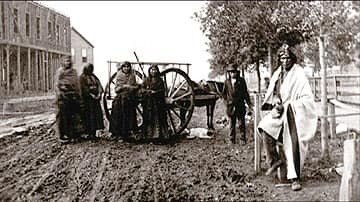 Founded in 1812, Red River was the first European farming settlement on the prairie. By the mid-1800s, it was a thriving region of European farmers, fur-traders and Métis - the offspring of white traders and natives. Riel's family was Catholic, French-speaking Métis. At the Collge de Montréal, Riel's exotic background fascinated his classmates. "He knew about pemmican and the tomahawk," classmate Eustache Prud'Homme said, recalling Riel's stories of the exotic west. Riel proved to be a good student, though introverted and moody. In 1864, his mood became blacker when he received news that his father, Jean-Louis, had died. Jean-Louis had been the de facto spokesman of the almost 6,000 French Métis who lived on the prairie. "The news plunged me... into the depths of pain," Riel wrote home. "I was advised not to write immediately... so as... not to sadden you too much... But I cannot contain myself any longer. We must cry, now and forever." Riel remained at the Collge de Montréal but his interest in the priesthood waned and he became more introspective. By 1866, he abandoned his studies and apprenticed at a law firm, sending money home to support his family. While working in Montreal, Riel fell in love with Marie Julie Guernon. But when the girl's parents discovered Riel was Métis, they broke off the engagement. A nun who knew Riel from his school days expressed her concern for the young man. "Louis is still in Montreal," wrote Sister Jane Slocombe of the Grey Nuns. "No one knows when he will leave. He has announced his departure for the fifth of this month, but he has been seen around here recently. This young man is incomprehensible and behaves most suspiciously. I fear this poor child does not have a good head on his shoulders. He needs someone to guide him, someone to follow him, but here he is on his own and none of his former friends have confidence in him, I fear it will all end badly." After the failed romance, Riel left Montreal. He lingered in Chicago and St. Paul for almost two years, then returned to Red River in July 1868. It was the first time Riel had been home since 1857. He was now a grown man of 24, bilingual, educated and worldly. Riel, the oldest son, took charge of his family and shortly took on a much larger leadership role. Like his father, Riel became a spokesman for the Métis. His prairie homeland was on the verge of transformation and Riel would make sure his people had a voice in their future.